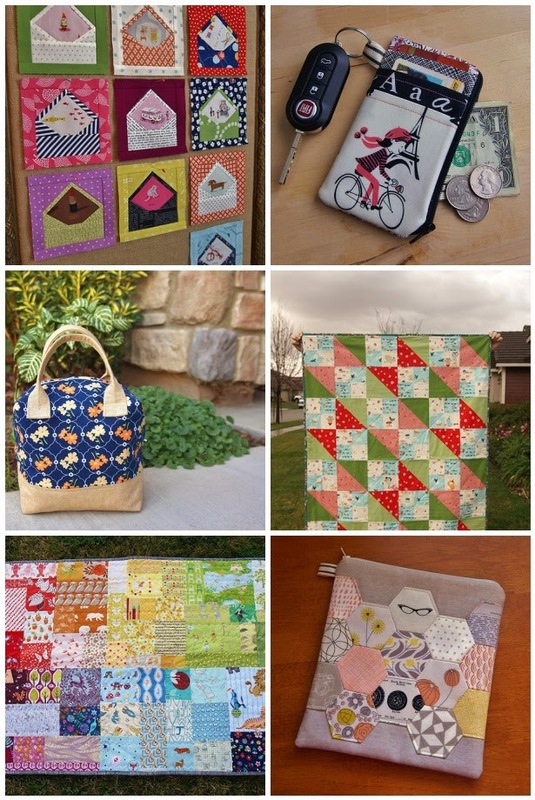 It’s been wonderful to hear how many of you are going to be sewing along with us for the Graph Paper Quilt Along! There's a lot of freedom built into this event on purpose. I want it to be a fun, relaxing experience for all of you. 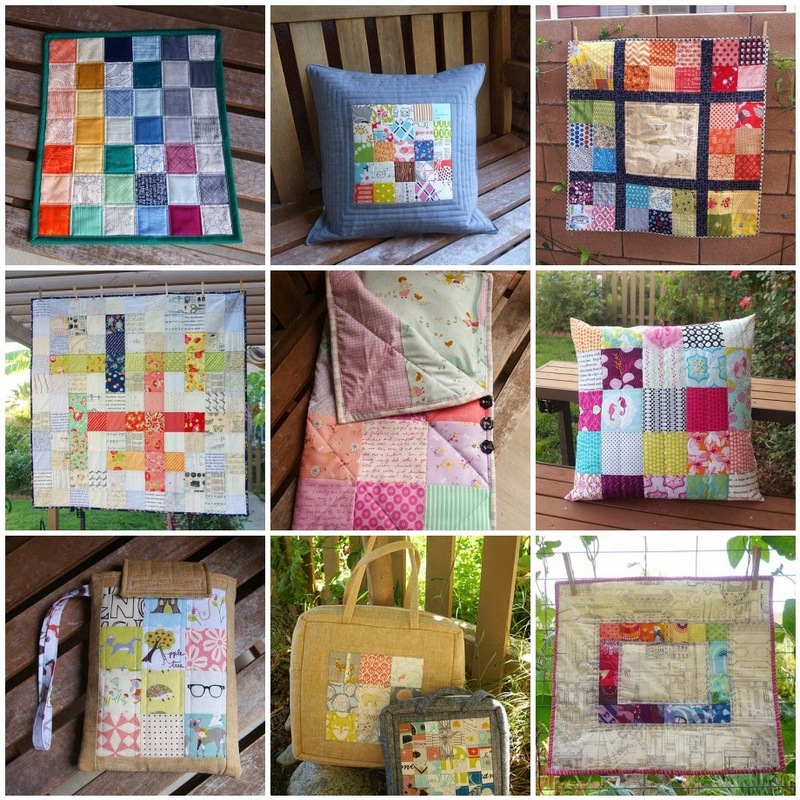 Remember that the only requirement is that you use patchwork squares – any size, any fabric, any pattern. Just to get you started, I’ve pulled together some ideas that will work for either your quilt or your small projects. Take a look and see what you like! I love these colors together. They remind me of summer sunsets. 1. Go Solid: a project made with only solids is so clean and modern. Limit your color palette for special effect. I used the print on the left from the Grey Abbey collection to guide the rest of my choices. 2. Go Low Volume: Use prints with a predominantly white or cream background for a look that’s quiet but still full of personality. I love mixing up a rainbow of colors with kid friendly prints. 3. Go Juvenile: Kid friendly novelty prints make wonderful “I-Spy” projects, perfect for games and storytelling activities with the little ones in your life. 4. Go Designer: We all have our own private hoards of fabric by our favorite designers. Instead of letting those prints languish on the shelf, this is your chance to showcase them in a practically foolproof project. Of course, there are plenty of other themes to choose from. Pick a design element like dots, flowers, or geometric prints. Take the color palette from one favorite print and pull other fabrics to match. Use two complementary fabric collections from different designers and mix them up for a totally new look. The possibilities are endless! There’s nothing wrong with just spreading your squares out randomly and sewing them together, but some of you may be looking for something a little more unique or would just rather work off an established pattern. Here are some links that might interest you. I've always loved graph paper...something about all those little squares of possibility lying there in front of me. It was one of my favorite things to draw on as a child, perfect for creating intricate mazes when I was a teenager (any of you remember those? ), and now works as my trusty sketchpad for new sewing ideas. So when I was choosing a name for my next event here at Fabric Mutt -- yes, a square centered event -- I just couldn't resist calling it the Graph Paper Quilt Along. Believe me, I love a challenging new quilt pattern; I can appreciate the joys of paper piecing and improv quilting, and I like a good sampler every now and then. Over and over, though, I find myself returning to the simplest method of quilt piecing: the humble patchwork square. I love working with squares, as you can see from the mosaic above, for several reasons. They're so versatile for one thing. The squares can just be squares, or they can be part of a bigger picture like a checkerboard, modern crosses, or a pixelated design of your own. I also love that fabric really takes center stage in a quilt full of squares, and they're absolutely perfect for fussy cutting -- something I love to do. There is a simplicity here that speaks to my soul when I'm feeling worn down or in need of fresh inspiration. Option #1: Make a quilt. The only rule is that your quilt has to be made of squares. That's it. The size of the project (king size? lap size? mini size?) as well as the squares (1"? charm squares? layer cakes?) is up to you and so is the design made by your squares. I'll have some ideas for you to use as a starting point in my next QAL post, but start dreaming now. The freedom is unlimited here! Option #2: Make small projects. Every other Monday I'm going to post a link to a free online tutorial that features patchwork squares, and I'll have my own version of the project to show you. If you don't feel like you can commit to a quilt, no worries! Feel free to sew along with us by sewing up a small patchwork project each week instead. Option #3: Make a quilt AND small projects. Overachievers unite! We can do it all! If you've got the time and energy, spend a few days each week on your quilt and then a few days on the small project. You'll be overflowing with patchwork goodness by the end of this event! I debated long and hard about having sponsors and offering prizes for this quilt along, and though it's the norm to do so, I decided against it this time. Though I love a nice prize package as much as the next person (and believe me, I do! ), I don't want there to be the slightest smidgen of pressure on anybody during this event. Every once in a while it's nice to participate in a sew along with no judging, no comparing yourself to others, and no killing yourself to finish something by a deadline for the chance of winning free stuff. It's just you and your fabric having fun together as you sew something that you love...and all of us cheering you on while you do it. 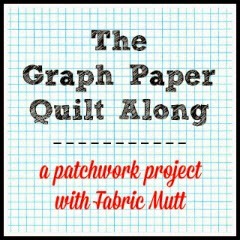 I'll be having link-ups here at Fabric Mutt every two weeks during the quilt along where you can share your small projects and quilt progress, and you can also post your photos in the Graph Paper Quilt Along Flickr group here. If you'd like to have an official quilt along button for your blog, just grab the code from my sidebar on the left. 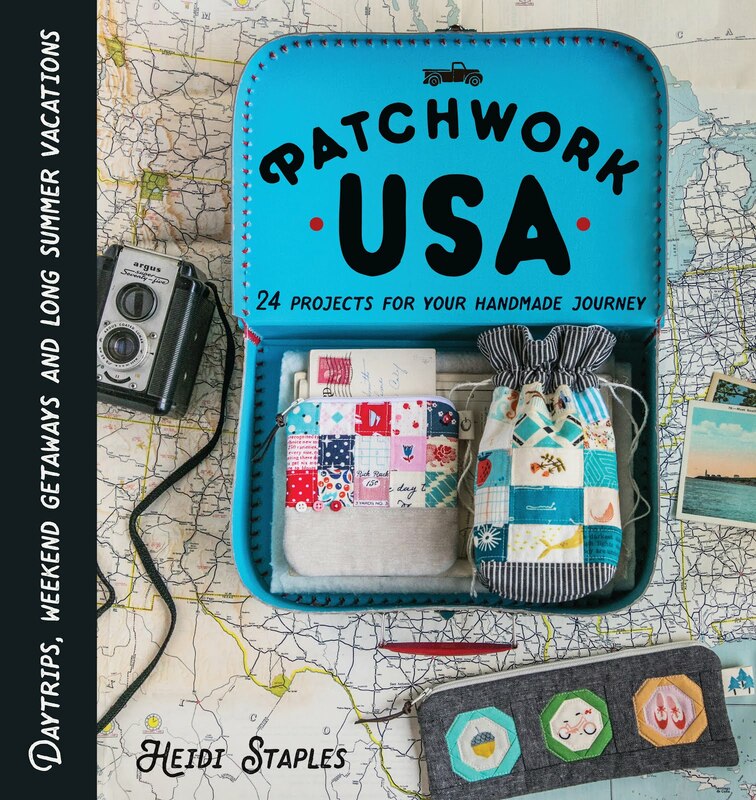 July 7th: The Final Link-up -- Show us the patchwork! 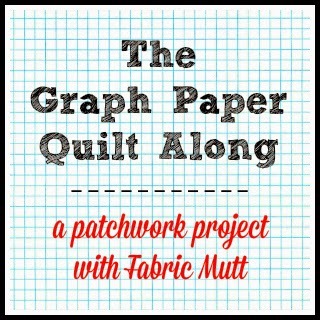 I'd love it if you would share the word about this event on your blogs and social media -- use the hashtag #graphpaperqal and you can tag me @fabricmutt too if you like. This quilt along is perfect for beginners or those new to any sort of sew along, so all rookies are welcome here! If you have any questions, feel free to email me at hjstaples@gmail.com. Okay then...pull out your graph paper and a stack of colored pencils...ready...set...go! Sew together a stack of prints by Anna Maria Horner. Add some dense quilting courtesy of Aurifil thread in a lovely shade of gold. Be sure to sew back and forth in different directions to tug at the center seam so that it waves gently down the runner. Include a Juliana Horner print on the back and some Kona Ivory for the binding. Sit, stare, and be happy. Coming soon to a blog near you...the most laid back quilt along of all time. More details to come in a day or two! First off, congrats to Janet who won the Giveaway Day prize from Fabricworm! I've sent you an email, Janet! Thanks to everyone else who stopped by this week. I hope to see you here again! Even though there are more pockets on the front, you can follow the same assembly instructions from the original tutorial, and it should all work out okay. Let me know if you have any questions. If you make one, be sure to share the photo with me by email or tag it #glassespouch and tag me @fabricmutt on Instagram. My little Bear started wearing glasses just over a year ago. She wasn't much over six months old when we noticed that she had a lazy eye, but her doctor was kind enough to hold off on ordering her glasses until she was three years old and had some chance of keeping them on. When I think of how irresponsible I was with my own glasses as a child, I've been pretty impressed with how quickly and calmly Bear accepted her pair as a part of life. It may have something to do with the fact that my little sweetheart is blind as a bat without them. Everyone from the eye doctor to his nurse to the guy selling the shockingly thick pair of lenses to us at Costco kept insisting, "Make sure she wears them all the time. She really needs them." Those of you who have children who wear glasses know that those lenses stay clean for approximately fifteen minutes out of every day, so we've learned to keep a large supply of lens wipes on hand to help with the constant smudging. Bear has been begging me to sew a case for her glasses, preferably one with a compartment for wipes too. I was thinking through ideas of how I wanted to design it, when it suddenly occurred to me that all I had to do was enlarge my key pouch tutorial from earlier this month. And the rest is history. All the prints in this project come from Lotus Pond, Rae Hoekstra's adorable new collection for Cloud9 Fabrics. I've been excited about this fabric since I saw the first images months ago, and it's even better in person. I love her color choices (nowhere else have I seen that perfect shade of kelly green) and those sweetly whimsical illustrations. I'll definitely be buying more of this collection in the months to come. 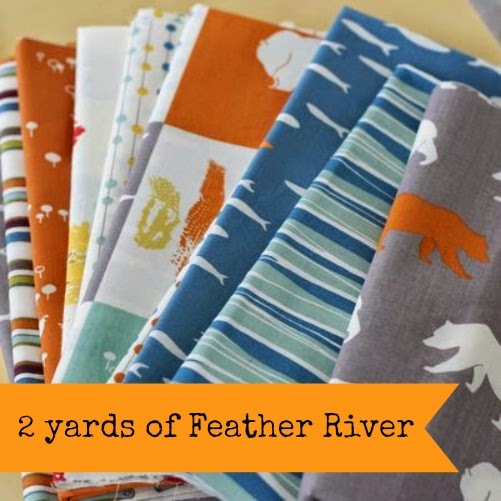 Two yards of Feather River from Birch Fabrics is still up for grabs until Friday night, so stop by my Giveaway Day post to get your name in the drawing if you haven't done it yet. I've had so much fun getting to know more of you this week through your comments on that post. Meet me back here on Friday, and I'll have a winner for you! 1. The Blog: If you visit my blog on a weekly basis, you're going to see projects and tutorials like those featured in the mosaic above. Click on any of the buttons to the left if you'd like to stay posted on what I'm making. I'd love to see you here again! 2. The Prize: My lovely friends at Fabricworm have donated two yards of Feather River by Jay-Cyn Designs for Birch Fabrics to share with one of you. I'm a huge fan of Birch's organic fabric, and this soon to be released collection is absolutely perfect for summer sewing projects! You can see the whole collection here at Fabricworm. 3. The Drawing: To enter the giveaway, all you have to do is leave a comment below answering this question: What's your favorite kind of sew along: quilts? bags? small projects? sewing through a whole book? Followers, new and old, can leave an extra comment for a second entry. Please make sure that your email address is in your comment if you're a no-reply blogger. The giveaway is open internationally and will stay open until 5pm on Friday when I'll choose a random winner. If I don't hear from the first winner within 48 hours, I'll have to pick another name, so be sure to check your email this weekend! There are approximately three things that remind me that summer is on the way. Of course, this year Beth is freshening things up with a new name, but I guarantee that you'll find the same great content that this blog hop brings to the web each summer: great advice, fresh faces, and new inspiration. 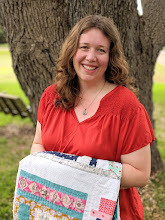 If you've started a sewing blog sometime in the last two years and would like the chance to introduce yourself to the modern quilting community, visit the official blog hop page to find out how you can get your name in the ring. Can't wait to meet you! Step 1: Take the three rectangles for the outer pockets and fold them in half, wrong sides of fabric together, so that the short ends meet. Topstitch each piece 1/4" below the fold. Step 2: Stack the outer pockets in place on top of one of the zipper pouch exterior rectangles, making sure that the pockets line up in the correct order from small to large (see photo above). Fold the twill tape in half and stitch 1/8" from the raw ends to hold them together. Place the twill tape on the left side of the stack just above the large back pocket with the raw edges toward the left side (again, see photo). Baste the entire stack together 1/8" from the edge around the sides and bottom to hold everything in place. Step 3: Now that your front exterior piece is assembled, sew this together like a basic zipper pouch. Stack in this order from bottom to top, lining everything up on the right edge: front zipper pouch exterior piece with pockets, zipper (face down with pull at the top), zipper pouch lining piece. Sew 1/4" from the edge and press the fabric back from the zipper so that the wrong sides of the fabric are touching. Repeat with the other zipper pouch exterior and lining pieces on the other side of the zipper. Step 4: Unzip the zipper part way (do NOT forget to do this!) and then place the exterior pieces with right sides together and the lining pieces with right sides together (see picture below), clipping or pinning them in place. Make sure that the teeth of your zipper are pointed toward the exterior end of the pouch. Step 5: Starting at the bottom corner of the pouch lining, sew 1/4" from the edge all the way around the lining, exterior, and back around just past the other corner of the lining (see photo above), leaving a gap in the lining for turning and backstitching at both ends. Clip the corners and trim off the edges of the zipper. Step 6: Reach in through the lining and turn the bag right side out through the zipper. Poke out the corners of the pouch with a chop stick or turning tool and press it with your iron. Tuck the raw edges into the hole in your lining, press, and sew 1/8"-1/16" from the bottom edge of the lining to stitch it closed. Step 7: Tuck the lining into the pouch, press your bag one more time, and you're ready to go! If you make one of these and share it on Instagram, be sure to add the hashtag #keypouch and tag me too @fabricmutt. Happy sewing!